It’s that time of the year again when you tend to lock up the alcohol and give the liver a rest after rather over indulging at Christmas. It’s the same story year after year and I’m sure that it won’t ever really change. It is ‘Love your Liver’ month! So actually it is the perfect time to start looking after ourselves and cutting back on the alcohol consumption. It is however a time when our immunity can be at it’s lowest and therefore we can need to give this a boost. We all know the benefits of healthy eating (or we at least should do as a lot of media attention has been given to this topic). When recommending supplements, one of the biggest objections I receive is that they eat a healthy diet, and therefore they get all the necessary vitamins to stay healthy. WRONG! Due to the way that fruit and vegetables are imported and stored, a lot of the nutritional value of food can be lost, especially by the time that they are cooked as well. Yes, eating a healthy diet will of course stop many diseases from receiving few vitamins such as Scurvy and Rickets, but there isn't enough to keep us at OPTIMUM health. That's where we need a helping hand. There are various supplements that can be taken to help boost your immune system and help detoxify. These can be taken to build up immunity and ward off things like colds and flu, but can be taken in higher doses with the onset of the cold to help bring it to an abrupt halt! New to the Advanced Nutrition Programme range, the Colostrum-C capsules are designed to help support and strengthen the body’s immune system. 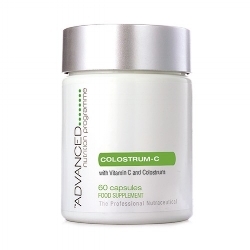 The Advanced Nutrition Programme's Colostrum-C is one of our favourite and best selling vitamin supplements. Colostrum is the substance produced by mammals in the first hours after giving birth. It naturally contains immunoglobulins (IgG) which is the most common antibody in the body. IgG antibodies are very important in fighting bacterial and viral infections. Suitable for men and women, take one or two capsules a day before a meal for best results. Do not take if you are pregnant, breastfeeding or lactose intolerant. 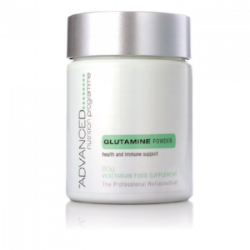 Advanced Nutrition Programme's Glutamine supplement is suitable for vegetarians. It provides the primary fuel of the digestive system and the immune system. This is an excellent supplement for those with a demanding lifestyle and during convalescence. This can be used as a brain cell fuel and is stored in muscles. Excellent for helping cure hangovers! All these supplements are available at Sarah Hurst Skin & Beauty. Please email sarah@sarahhurst.co.uk or ring the salon on 01273 270709 to come and have a chat about how our supplements can boost your immune system!